A Bedazzled [kind of] Life: 26. inpsired...by a Bengals fan? As a writer, it's always nice to inspire another person (especially a fellow journalist) for a post or article on their own site (or blog). Well today, I did it unintentionally with something that is completely not wedding related. 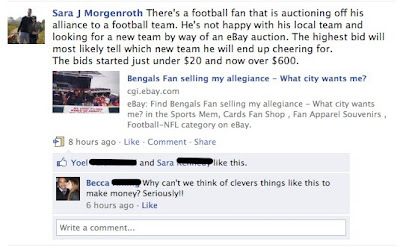 On my Facebook page (see below) I posted a link to eBay about a disheartened Cincinnati Bengals fan (as he should be) who is currently auctioning off his allegiance to another NFL team who will bid the highest. To the best of my knowledge, no official NFL team is actually auctioning "on" his allegiance; however, the bidding began at $19.95 because "it's mandatory that I at least have a hat to support my new team." Blah blah blah...the current bid is at, wait for it, $610 for the Chicago Bears. I think you will join me in saying "what economic problems?" Okay, now onto the part that matters to you wedding blog readers. My friend Rebecca took this thought..."auctioning off insert something" and seeing who will buy. Being that she is engaged she thought "How Much Would You Pay to be a Part of My Wedding?" Interested to read the rest? Click here. Whoops my bad. I believe the Pittsburgh Steelers are in the lead! THE NEW LEADER @ $610.00 is: THE BALTIMORE RAVENS!